As a child, there’s only so much fun you can have before you approach adulthood and are told you can’t do this and you can’t do that because it’s ‘childish’. Yep, that moment in time sucked because it signalled a near-end to a blissfully ignorant time in life and one of every child’s favourite activities was to pretend to ride something. 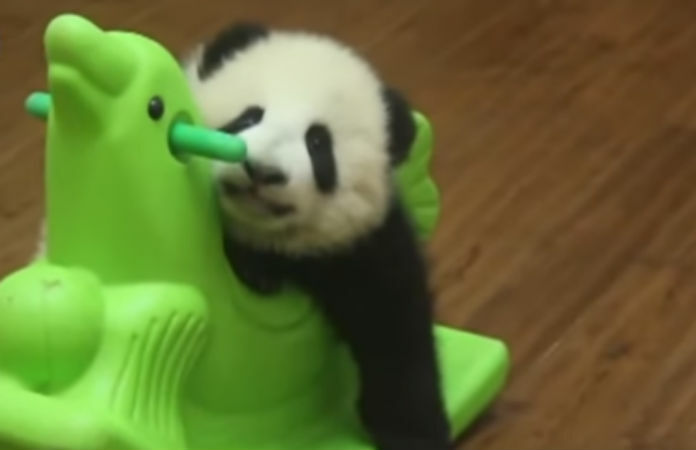 For many that often meant riding a toy car, but for others, having a toy horse was the closest they’d get to the real deal and watching this video of a baby panda going back and forth on one will no doubt bring back those memories! Qiyi- as well as being a massive cutie pie- is housed at the Chengdu Research Base of Giant Panda Breeding, and if repeatedly going down slides and eating bamboo wasn’t already a good enough life, they now appear to have discovered the joys of nonchalantly rocking back and forth. Next Story →25 Hilarious Photos That Almost Broke The Internet!